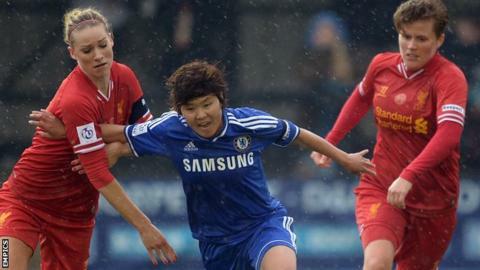 Chelsea's South Korean midfielder Ji So-Yun was sent off in a goalless draw with Super League champions Liverpool. Ji was booked for a foul on winger Gemma Davison and saw red five minutes from time for what was deemed a dive. Last season's runners-up Bristol Academy won 2-0 at Manchester City with an own goal and a fine strike by midfielder Angharad James. England forward Jess Clarke scored both goals as Notts County recorded a 2-0 win at Everton. Ji was dismissed as Chelsea were pressing for a late winner. Liverpool had made the better start, winger Davison's fifth-minute shot coming back off the inside of the post. The home responded with Ji and fellow midfielder Jackie Groenen both sending good efforts narrowly over the bar. Reds keeper Libby Stout had to be substituted after being injured in a collision with Japanese striker Yuki Ogimi early in the second half. Stout's replacement Danielle Gibbons was quickly in action, making a fine save from midfielder Laura Coombs. Chelsea bossed the closing stages, but striker Eni Aluko twice failed to take good chances before Ji's sending-off. County went ahead after just five minutes, when Clarke followed up to tap in after Katie Holtham's header came off the post. Sophie Walton, who had provided the cross for Holtham, then sent in the corner from which Clarke forced home her second goal a minute before half-time. Clarke also shot wide of the target as the visitors looked for a killer third goal after the break. But the Toffees almost reduced the arrears in the 75th minute, when a Kelly Jones header was cleared off the line by defender Laura O'Neill. Bristol bounced back strongly from losing their opening match at Chelsea, but for City it was a second successive defeat. A 10th-minute goalmouth scramble led to the opener. Bristol's Spanish striker Natalia tried to poke the ball in but it was deflected home off a defender. The lead was doubled seven minutes later, James shooting home from 15 yards after clever play by Laura del Rio. A third goal might have arrived midway through the first half as defender Jasmine Matthews headed just over the bar. City improved after the break but rarely threatened a goal. And they almost went further behind when Spanish striker Del Rio's 85th minute shot struck the woodwork. City are the only WSL top-flight team without a point after playing two games - but no side has a 100% record in a tight start to the season.